There are many instant chatting apps available in market nowadays. Whatsapp linked about half billion users. While chatting with smartphone there are many difficulties which have to users face like battery backup and another is internet connection. Along with Wi-Fi, 2G, 3G sometimes coverage area also become hurdle in chatting. In this users have to face many problems. A team named Open garden made a new app which is called Firechat. The main specialty of this app is that user can chat without internet connection by this app. Not only this but using this app there is no need of phone’s network too. If you are out of coverage area, still you can send messages by this app. And this app is totally free. First of all Firechat was launched for ios platform. According to track.in this app get about one lac download per day. In few days of launching this app is used by users 1.14 download per second. This data is of more than 80 countries. Firechat app is in top 10 social networking app of ios platform. Firchat gives facility to send messages without internet connection. This is the main reason of becoming popular of this app. Few days ago this app is also launched for Android operating system too. To download this app from Google play your smart phone should have 2.2 Android or above operating system. Size of this app is 2.8 MB. Although it is a great app in sense of features but this app also has few drawbacks too. • To use this app, in phone of users both who is sending message and who is receiving message should have Firechat. • The biggest drawback of this phone is that this phone is only work in 30-100 feet coverage area. It means message sender and receiver both should be in 100 feet coverage area. Open Garden group’s CEO Micha Benolil says that we are thinking to make a network which is made of people. In Android phone this app use Wireless Mesh Networking technology. 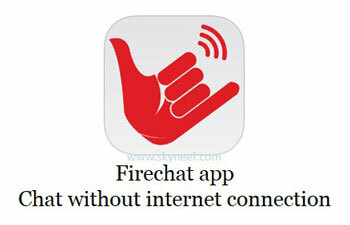 Firechat’s internet version also available which allows users to chat from long distance.